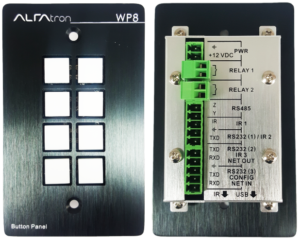 The Alfatron WP8 keypad is a compact, inexpensive control system where you require basic functionality to control equipment via Infrared, RS232 or RS485 protocol. Functions that can be used with the keypad, to name a few, can be – volume up/down – source selection – equipment on/off. The buttons/functions can be programmed as required by the client or AVC. This can depend on the complexity of programming required.. Unlike other control systems, the WP8 has its processor built into the keypad and all programming can be done directly on the unit with the basic software and USB cable. This software can be downloaded off the manufacturers website.. The WP8 fits into a standard 4×2 electrical box, no additional brackets are required for the fitment. There are easy to use “phoenix connectors” that requires only a small flat screwdriver in order to terminate/connect the wires to the back of the keypad. I have used this user-friendly keypad at numerous clients where basic control is required. Johan is an AVC sales executive and has worked in the Audio Visual Industry for nearly 5 years.